Update 8.1.2012 – Thanks for the mention Cee! Clothing Size Reference: I am 5’2 1/4″ about 103-109 lbs and my measurements are 32-25-32. I wish there was a way to edit my Modcloth review to include my measurements. Will it fit me comfortably? I think size S is better suited for someone who doesn’t have a big bust. Not sure about the other sizes. Caring for this garment: I dry cleaned this top after I wore it twice. Update 6.11.2012 – Thanks for the mention Jean! As promised, I’m reviewing this unique top that I recently purchased from Modcloth (in size S by Comme Toi). I received the package on Friday and the dress was a sack on me so this will only be a review for the top. The blouse is very sheer so I wore a black cami underneath. It looks exactly as pictured online. I love the grosgrain bow details in front, the buttons down the back and on the sleeves and the piping detail around the sleeves. The sleeves are not too tight and don’t stretch out. There is about 1.5 inches additional of room when buttoned (and I don’t have particularly skinny arms). The sleeves hit just below the elbow on me so it wasn’t uncomfortable when I bent my arm. I’m pretty flexible so I had no trouble fastening the buttons down the back. 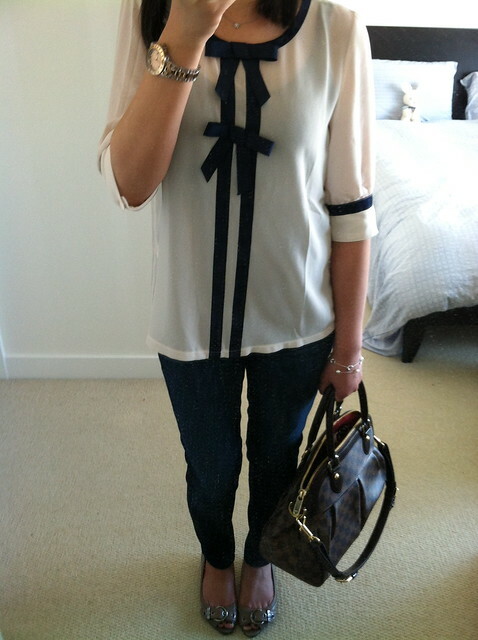 I wore the blouse all day and the shape held up well and still looks great by the end of the day. I did have a hard time trying to get the lines out from where it was folded in the packaging but it should be perfect the next time I wear it because it’s going into my dry cleaning pile. A definite a keeper– get it before it’s gone! Update 05.14.2012: My review is now live on Modcloth.com! ohhh adore this!! you look so parisian chic!! i love love that they did not 1 but 2 bows on your blouse!!! LOVE!!! Thanks Lisa! In addition to polka dots I also love anything with bows. :)I ordered this polka top that was sold out and came back in stock. I hope it fits since the reviews are iffy.